Celestyal Cruises is a subsidy of the huge Cyprus-based travel and tourism group Louis plc, founded in 1935. 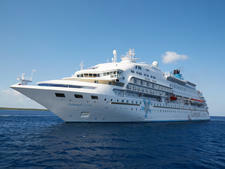 It was born out of the former Louis Cruise Lines, which operated since 1986, which no longer exists. In 2014, the line rebranded the ships under the Celestyal banner. The move was designed to evoke a "divine, Greek experience" (Celestyal means heavenly in Greek) and put make a clean break from the past. Celestyal also renamed the ships' restaurants, bars and theaters after Greek mythology, implemented Greek touches like language and dancing lessons, and overhauled the menu to focus on Greek food and wine. In late 2013, Celestyal Crystal was chartered to a new Canada-based line, Cuba Cruise, and operated round-Cuba sailings for four months before returning to the Mediterranean. During those sailings, the ship was rebranded with Cuban-inspired decor. The relationship with Cuba Cruise ended in 2015, and the ship operated under the Celestyal brand, homeporting in Cuba year-round from November 2016. In late 2017 Celestyal pulled out of Cuba, choosing to concentrate on its core region: the Aegean, operating just two ships: Celestyal Olympia and Celestyal Crystal. In 2019, it will expand beyond the Aegean and will return to Istanbul for the first time since suspending cruises there in 2016. It will also add calls in Egypt, Israel, Turkey, Cyprus and Rhodes on Celestyal Crystal. Rebranded as Celestyal Olympia in 2015, the 1,664-passenger ship has undergone a number of reincarnations in its 34 years afloat. Celestyal's mainly short, port-intensive itineraries don't leave much time for onboard activities, but they stick as closely as possible to the traditional cruise format. Dinner is held in two seatings, while breakfast and lunch are open-seating, either in the dining room or the buffet. Production shows are geared toward an international audience, and there's plenty of live music in the bars and lounges. 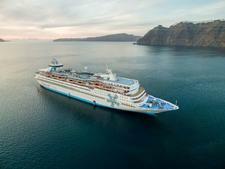 The ships also have pool decks, small spa/gym complexes, casinos and shops for sundry items. There's no doubt that the ships are getting on in age -- in some cases more than 30 years old -- and although they are regularly refurbished (which, in the case of Crystal, includes adding balconies), they're showing signs of wear. When the company rebranded as Celestyal in 2014-2015, the vessels received extensive renovations in the public areas and cabins. There's a fun, friendly vibe onboard -- the small size of the ships and long service of crew leads to a friendly, personalised service, wherever you are in the world. The passengers on each ship vary widely from cruise to cruise. Greek Isles cruises mainly attract package tourists from all over the world (typically Europe and North America); the nationalities will depend on which tour groups are booked on each particular cruise. When it sails in the Med, Celestyal Cruises attracts a wide age range of travellers, from people in their 20s to those in their mid-70s. As a rule, shorter three- and four-night Greek Islands itineraries tend to attract a younger crowd. Children are welcome onboard but tend to be more in evidence on Mediterranean itineraries during the summer season. The Celestyal Cruises fleet currently consists of just two ships. The flagship is the 1982-built 1,664-passenger Celestyal Olympia, which was previously under charter (until 2012) as Thomson Destiny (originally Royal Caribbean's Song of America). A large refurbishment took place in 2014, with upgrades to cabins and public areas. The 1,200-passenger Celestyal Crystal entered service in July 2007. This 1,096-passenger ship was built in 1992 and is probably best known to Americans as Norwegian Cruise Line's former Leeward. The second-largest ship in the fleet, Celestyal Crystal has a far wider range of public rooms and cabins than most of the fleet. Despite the varying sizes, ages and level of amenities, both ships are well maintained and have had significant refurbishments. And, while most lack the latest features (such as balconies and alternative restaurants), all the basics are there. Celestyal Cruises' focus is on the destinations, and the ship is more like a floating hotel, rather than the focal point of the cruise experience.